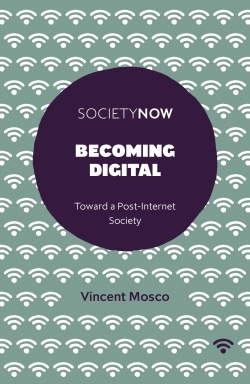 Becoming Digital examines the transition from the online world we have known to the Next Internet, which is emerging from the convergence of Cloud Computing, Big Data Analytics, and the Internet of Things. The Cloud stores and processes information in data centers; Big Data Analytics provide the tools to analyse and use it; and the Internet of Things connects sensor-equipped devices everywhere to communication networks that span the globe. These technologies make possible a post-Internet society filled with homes that think, machines that make decisions, drones that deliver packages or bombs, and robots that work for us, play with us, and take our jobs. The Next Internet promises a world where computers are everywhere, even inside our bodies, “coming alive” to make possible the unification of people and machines in what some call the Singularity. This timely book explores this potential as both a reality on the horizon and a myth that inspires a new religion of technology. It takes up the coming threats to a democratic, decentralized, and universal Internet and the potential to deepen the problems of commercial saturation, concentrated economic power, cyber-warfare, the erosion of privacy, and environmental degradation. On the other hand, it also shows how the Next Internet can help expand democracy, empowering people worldwide, providing for more of life’s necessities, and advancing social equality. But none of this will happen without concerted political and policy action. Becoming Digital points the way forward. Vincent Mosco is Professor Emeritus, Queen's University, Canada where he held the Canada Research Chair in Communication and Society. He is also Distinguished Professor, New Media Centre, School of Journalism and Communication, Fudan University, Shanghai. Dr. Mosco is author or editor of twenty-one books and over 200 articles and book chapters on communication, technology, and society. He is an IAMCR member.